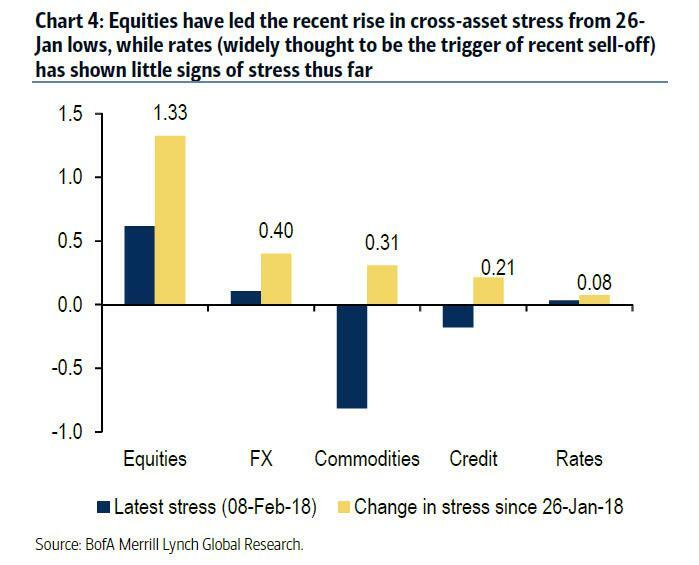 BofA's 'Critical Stress Signal' Was Just Triggered: "This Is Where Central Banks Step In"
The last two hours of trading on Friday aside, when a violent short squeeze coupled with unsubstantiated speculation by JPMorgan that the quant deleveraging and selling is finally over send the Dow Jones soaring over 600 points in under an hour, the stock market remains especially volatile and vulnerable to even the smallest shifts in sentiment. 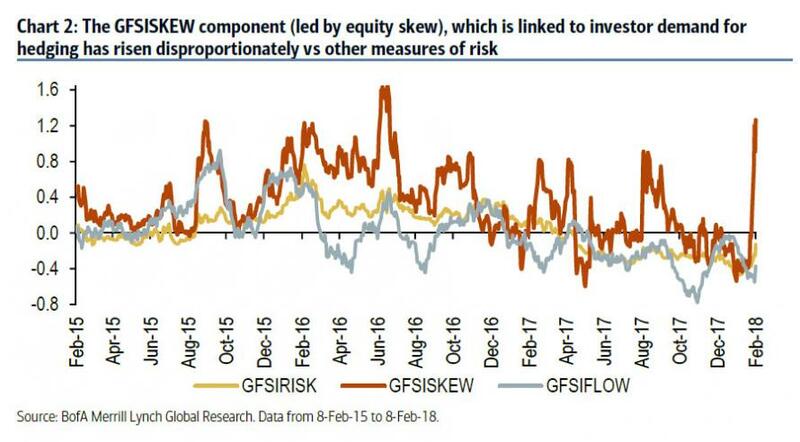 Meanwhile, as Bank of America's derivatives team writes, the bank's proprietary Critical Stress Signal (CSS) was triggered to "Risk-off" on 8-Feb-18, with 13 components rising by more than 0.5 standard deviations in a 10-day period. 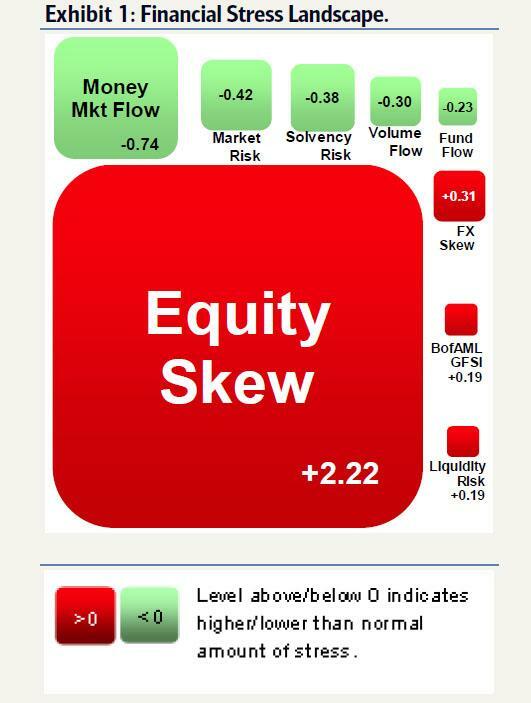 Looking at the internals of the index, it's a familiar story: there was an eruption in equity vol which promptly cascaded across stock markets, while keeping other asset classes relatively insulated. However, as we showed over the past two days, there have been distinct instances of contagion from stocks to credit, rates, FX and even commodities, and as equity vol is sliding, X-asset vol continues to rise. ... but it was a follow-on from FX and credit risks in recent days that tipped the signal into risk-off territory. Further to the lack of a broader market selloff, while concerns over rates risks are the common narrative, the stress in rates components have remained relatively subdued thus far. However, as BofA notes, further instability in rates and credit, along with CB reactions to this stress remain key to monitor, in our view. The good news: the more isolated the risk remains within equity, the more easily we expect it will reverse. The bad news: the lack of a response is due to investor expectations that should conditions deteriorate, central banks will step in. 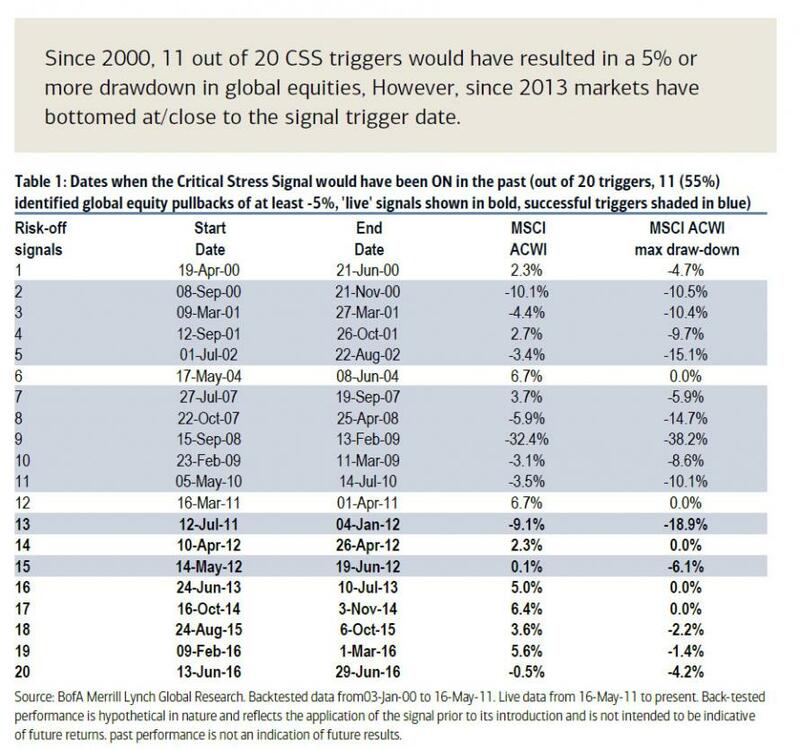 Which bring us to the punchline of the BofA report: according to BofA strategists, the CSS was designed to identify tipping points in cross-asset risk – "the point at which stress momentum keeps building and risk-assets suffer." 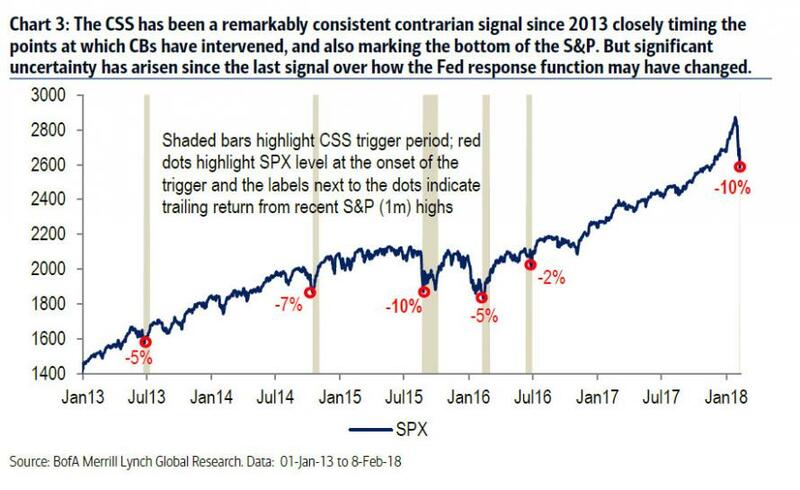 Paradoxically, beginning in 2013 with the taper tantrum, the Critical Stress Signal has been a remarkable contrarian indicator, as it has closely aligned with the timing of central banks either verbally or physically intervening to calm markets. In other words, the worse things got for the market, the greater the likelihood that central banks step in and support it. Or, as Michael Hartnett puts it, "markets stop panicking the moment central banks start panicking." As seen in the chart below, this very moment is when one or more central banks should reassure the market that all shall be well. It also explains the violent BTFD moments at the tail end of any selloff as algos and human traders scrambled to frontrun central bank intervention following a market selloff, creating a self-fulfilling prophecy of market rebounds which no longer needed central banks to bail them out: the mere precedent was sufficient. The problem - for investors - is that the precedent may no longer be sufficient as policy intentions are now far more nebulous when it comes to the probability of an imminent central bank intervention, either verbal or physical. As BofA admits, "since the last stress signal in 2016, rates and inflation expectations have increased, we have a new Fed chair, and CB rhetoric appears more hawkish, creating uncertainty over where the “CB put” strike sits today." And that's the $6.4 trillion question: at what level - if any - in the S&P will central banks step in? So far, there have been no clues or hints as to the answer. Worse, actual statements by central bankers have been decidedly non-interventionist: last week, as investors finally woke up to the likelihood that central bankers are serious about pulling back stimulus this year to control inflation, Bank of England Governor Mark Carney declared on Thursday that he may even need to raise interest rates faster than previously thought. Adding to the rate volatility - and equity selloff - the BOE effectively put investors on alert for another increase perhaps as soon as May by lifting its forecasts for economic growth and saying inflation will remain above its 2 percent target. "It will be likely to be necessary to raise interest rates to a limited degree in a gradual process, but somewhat earlier and to a somewhat greater extent than what we had thought in November. Domestic inflationary pressures are likely to firm", Dudley said. This sentiment was echoed in Europe, where ECB speakers also brushed aside the sell-off by continuing to debate how to end their bond-buying program, which is currently set to run until September. "Policy makers should not allow ourselves to become unsettled by the decline in equity prices we have just witnessed,” Bundesbank President Jens Weidmann said in Frankfurt. “More volatility in the markets, and maybe addressing some of the excesses and imbalances in the markets, by having a little more volatility, may be a healthy thing,” Dallas Fed President Robert Kaplan told Bloomberg TV on Thursday. One day later, Philly Fed president Patrick Harker said equity volatility makes sense based on yields, effectively capping stocks as long as yields keep rising, in the process pushing up volatility. Fed’s Harker Says Equity Volatility Makes Sense Based on Yields. Finally, outgoing NY Fed president Bill Dudley completed the trifecta stating that he is not at all worried the recent market drop will have an impact on the economy. Meanwhile, despite Friday's afternoon's miraculous bounce, the mood remains gloomy. For UBS Group AG Chairman Axel Weber, a former ECB policy maker, that’s nothing to fear. "The market has shown an unprecedented level of complacency,” he told Bloomberg Television. “A correction was waiting to happen." The bigger question is when does the correction become a crash. Because if so far it has been the expectation that central banks will step in any minute now which has prevented the equity rout from going systemic, a few more days of silence by central banks, and last week's sharp selloff will seem like a dress rehearsal to the 10 years of pent-up mean reversion that may slam global capital markets as normalization finally kicks in.